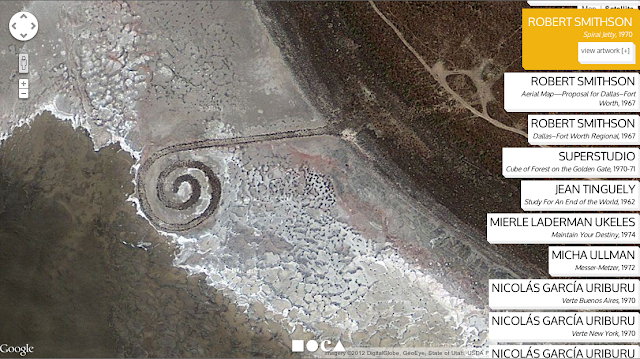 Screen shot of L.A.MoCA’s Land Art exhibition website showing Robert Smithson's Spirial Jetty, 1970. The Los Angeles Museum of Contemporary Art's exhibition Ends of the Earth: Land Art to 1974 (until September 3, 2012) has a website that uses Google Maps to display the most well-known sites including Robert Smithson’s Spiral Jetty, the Christos’ Wrapped Coast and Claes Oldenberg’s The Hole. How to Make It in the Art World is a list of 18 “rules” written by Jerry Saltz and other critics and contributors to New York Magazine. Some are fun and interesting; others will test the tolerance of any "ilunga" (see below). Arigata-meiwaku (Japanese): An act someone does for you that you didn’t want to have them do and tried to avoid having them do, but they went ahead anyway, determined to do you a favor, and then things went wrong and caused you a lot of trouble, yet in the end social conventions required you to express gratitude. Gigil (pronounced Gheegle; Filipino): The urge to pinch or squeeze something that is unbearably cute. Ilunga (Tshiluba, Congo): A person who is ready to forgive any abuse for the first time, to tolerate it a second time, but never a third time. Pena ajena (Mexican Spanish): The embarrassment you feel watching someone else’s humiliation. Finally, this weekend is the biggest art event of the year in Bushwick — Bushwick Open Studios. This year there will be more than 500 studios (this is not a typo!) as well as many concerts, dances, performances and other events. Best bet: begin at 56 Bogart Street (across from the Morgan Street L train) where most of the galleries are located, and work your way south and east.